Everyone in the health industry is looking for that “fountain of youth.” No one’s found the miracle cure for age yet, but a recent piece of research is showing that high-intensity interval training (HIIT) may be the best form of exercise to slow down aging—and it echoes the results from older studies, too. Diet, exercise, and enjoyment are recurring themes in every piece of research highlighting longevity. And for good reason: When you treat your mind and body right, they often return the favor. And this particular form of exercise is an excellent example of that. If you’ve done HIIT, you either love it or hate it. It’s likely the most divisive form of exercise, but it could also be the most beneficial. Especially for older adults. High-intensity interval training is known for its vigor. It requires maximal effort for short bursts—typically from 30 seconds up to a few minutes—followed by a rest period for roughly the same time period. The pattern is then repeated for a few cycles, totaling anywhere from 15 to 30 minutes. Because of the effort required, HIIT is usually done a few times per week maximum. Can HIIT Turn Back Time? HIIT is associated with increased cardiovascular capability, muscular recovery, muscle growth, fat loss, and other benefits. But when it comes to seniors—or the aging population—its greatest value may lie in its ability to reverse the cellular aging process in ways moderate exercise, or even strength training, cannot. In a recent study, researchers randomly divided 72 young and older adults into three supervised exercise groups. The first group performed HIIT training three times weekly. The second group did moderate aerobic exercise five days per week. The third did strengthening exercises twice weekly. The study found that HIIT boosted mitochondria function in the muscle among older adults, meaning it enhanced the body’s absorption and use of nutrients while “revving” up gene-related muscle growth. Now, that isn’t to say that other forms of exercise like moderate or steady-state cardio (walking, jogging) or weight training aren’t beneficial. They are. Every group in the study showed positive results. They just do different things—all of which will help extend your life and battle aging. In fact, if you’re sedentary or active and have never performed high-intensity interval training before, I would not recommend it right away. HIIT is something to work towards. Regardless of fitness level, your HIIT program should first be approved by a doctor or performed under professional supervision. It is very hard on the body and really should be eased into with an appropriate schedule. Here’s how to start if you get the go-ahead from your doc. People who are sedentary should start first by performing steady-state walking, working their way to the point where they are comfortable jogging for about 30 minutes. Once that is achieved, you can start with short intervals of, say, 30 seconds to one minute of vigorous running or pedaling and one to two minutes’ rest before repeating. As you progress, your intense intervals can increase and rest periods decrease. Performing high-intensity interval training for a max of 30 minutes a few times a week is all you need. 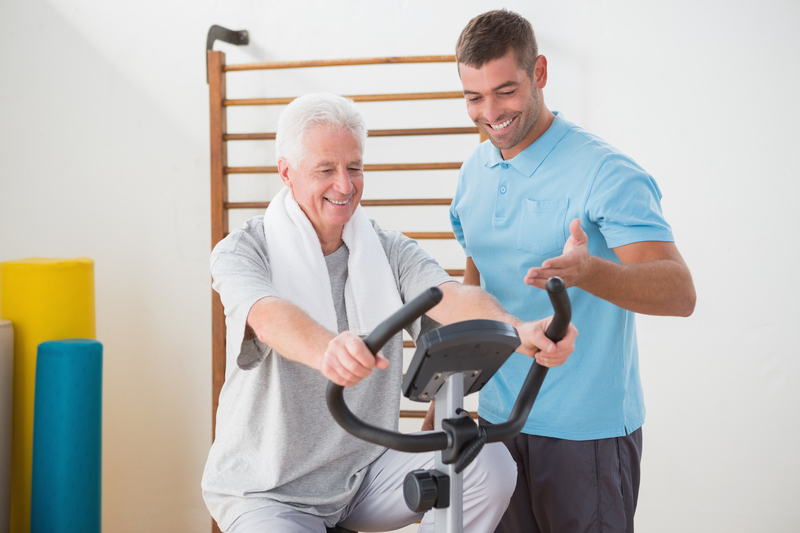 “Exercise: The Cellular ‘Fountain of Youth’,” Medline Plus, March 28, 2017; https://medlineplus.gov/news/fullstory_164328.html, last accessed April 4, 2017. Kravitz, L., “High-Intensity Interval Training,” American College of Sports Medicine, 2014; https://www.acsm.org/docs/brochures/high-intensity-interval-training.pdf, last accessed April 4, 2017. Brody, J., “Why Your Workout Should Be High-Intensity,” New York Times, January 26, 2015; https://well.blogs.nytimes.com/2015/01/26/sweaty-answer-to-chronic-illness/?_r=0, last accessed April 4, 2017.